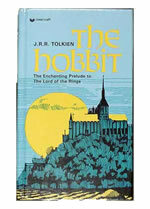 A major part of my Tolkien book collection concentrates upon one single book, namely 'the Hobbit'. 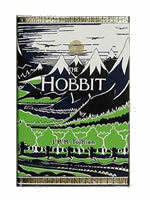 This is the book where it all started from for me and for Tolkien in a more worldly way. It is this book that has been published over and over again... and i guess its publication history might be one of the most interesting of all books ever published. Really, there is a jungle out there of publications and it is truly hard to get trough it and get a clear picture.... so our quest starts here. Let us arrange and show all known editions of Hobbits in a row. I'll start here and show all books i have in my collection and will add all books (with credits) by all you if you manage to find others not covered here (mail me (please with pictures) to info@tolkienlibrary.com). I'm am still photgraphing and ordering most of my books in my collection so please be patient, but do not hesitate to contact me any way if you know other editions no mentioned here. The First Impression of the first UK edition was published September 21, 1937 by George Allen &Unwin Ltd. It was limited to only 1500 copies. 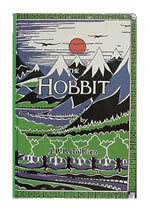 It exists out a light green cloth binding over boards, imprinted with a stylized Misty Mountains scene in deep blue ink along the top, all the way around, and a dragon at the bottom, both front and back. A dust jacket in green, black, dark blue, and white, showing a drawing of stylized mountains with the moon and eagles soaring above, a forest, and a river. The end paper maps in are in red, black, and white. All artwork is by Tolkien. Originally Tolkien intended the flying dragon and the sun to be painted red, but budget restraints forced the red color to be substituted with black. The very first printing had no color illustrations within the book itself, but included 10 black-and-white illustrations along with the the two maps (wich in the beginning were intented to have been 5 maps). The book contained 310 pages. It was 19 x 13.5cm (7.48 x 5.31in). 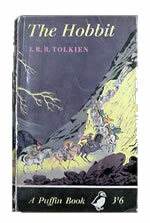 By December 15 of 1937, the first printing was sold out and a second impression was quickly prepared, the Second Impression of the first UK edition. Originally there were 2,300 copies which were marked "Second Impression 1937" (although it was actually published in January 1938). But during the bombing of London in 1940, 423 unbound copies were destroyed by a fire at the bindery of Key &Whiting (leaving us only 1877 copies, just 300 more the the first impression). This second printing converted four plates to color. The line drawing of the Hill: Hobbiton Across the Water (p4) was replaced by a color frontispiece of The Hill: Hobbiton Across the Water. Three other color plates were added: The Fair Valley of Rivendell facing page 59, Bilbo Comes to the Huts of the Raft Elves, facing page 192, and Conversation with Smaug, facing page 228. The second impression is the only UK 1st edition published with 4 color and 9 mono plate illustrations; making it very easy to recognise. 1938 - 1st/1st US HMCo. The First Impression of the first US edition was published in 1938 by Houghton Mifflin Co. of Boston &New York. Tan cloth binding over boards, imprinted with a bowing hobbit in red to the upper right of the title on the front. 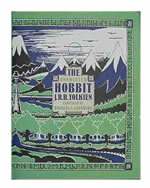 Dust jacket in blue with the Hobbiton frontispiece in color in front. 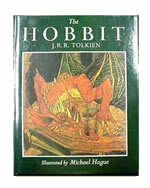 Title page shows outline of the same bowing hobbit as on the cover. All artwork by Tolkien. 15.1 x 21.0 cm, 310 numbered pages. 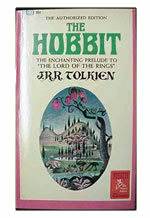 Title page bowing hobbit insignia was changed to the publisher's device of a seated flautist sometime during the run. The First Impression , or First State of the first American edition was published in 1938, specific date unknown. The number of copies of the first state is also currently unknown. The Second Impression , or Second State was published March 1, 1938, limited to 5,000 copies. 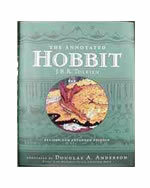 The first American editions of the Hobbit were published by Houghton Mifflin Company, Boston. 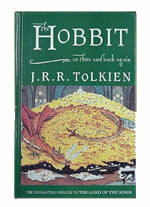 The first American editions differed significantly from the UK editions by the inclusion of four of Tolkien's color plates. Two of these were used on the dustjacket, the Hill: Hobbiton Across the Water (on the front cover) and Conversation with Smaug (on the back cover). 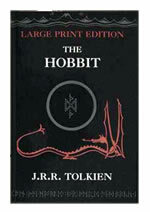 Houghton-Mifflin also decided to place a small figure of a bowing hobbit on the title page and the cover. Unfortunately, this hobbit wore boots! To be fair to the publisher, this hobbit was modeled on the hobbit figure in Tolkien's illustration, Conversation with Smaug. The hobbit in the illustration also wears boots. This figure was removed at some point in production, probably as part of the second impression. Four paintings were used in the first American edition. In late 1942, Allen &Unwin printed 1,500 copies of a third impression under their imprint, which ws to be 'a cheaper edition'. The third impression is dated 1942 and is similar to the fist UK impression of 1937 but smaller. 13.0 x 19.0 cm, 310 numbered pages. The other difference is that the color plates have been removed (except for the frontispiece). Presumably as a result of war-time shortages, Allen &Unwin designed an inexpensive version of the third impression. This version omitted all of the color plates except the color frontispiece of The Hill: Hobbiton Across the Water. 3,000 copies for the childrens book club sold by the bookseller Foyles. The third impression printings were supplied to Foyles unbound, and are in fact Same sheets as Allen &Unwin 1942 adition, but without the maps and without frontispiece. They were bound independently, in yellow, gilt-stamped cloth over boards. 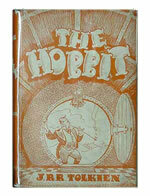 The dustjacket was black, orange and white, featuring a drawing of a dandified Hobbit. 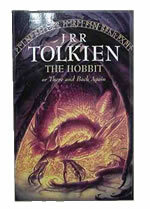 Tolkien commented "Surely the paper wasted on that hideous dust-cover could have been better used". 13.0 x 18.8 cm, 310 numbered pages. The fourth printing consisted of 4,000 copies dated 1946 but not officially published until November 18, 1947. Similiar to the third impression, this version was produced to the "War Economy Standard" of the day. These copies tend to be very, very fragile. 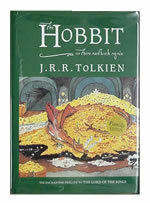 The second edition of the UK Hobbit was published in 1951 (3,500 copies). It is also referred to as the fifth impression. Page 8 is marked First Published in 1937, Second Impression 1937, Reprinted 1942, Reprinted 1946, Second Edition (Fifth Impression) 1951. The front of the dustjacket is marked "Fifth Impression". Covers and dust jacket in same art as the first Allen&Unwin edition of 1937 but the size has changed: 13.0 x 19.0 cm, 315 numbered pages. As with the Allen&Unwin 1942 edition it has a color frontispiece and otherwise black-and-white illustrations. The dustjacket also includes press statements from The New Statesman and Nation, Observer, London Times and Lady. The text also has some corrections of the fourth impression but a number of errors remained. As Tolkien was writing the Hobbit sequel, The Lord of the Rings, he became aware of inconsistencies between the characterization of Gollum in the Hobbit and the features of desperation and obsession with the Ring that were required as motivation for his behavior in The Lord of the Rings. The original Gollum was less crazed and degraded by his long association with the Ring. As a result, Tolkien substantially revised Chapter 5. These are described in detail in the Annotated Hobbit. 1951 - 2nd/1st US HMCo. The first of these revisions were made in 1947 and incorporated into the new edition of 1951. 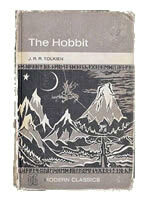 The second American edition of 1951 was constructed by binding 1,000 copies printed in the UK by Allen &Unwin. Only the title page and dust jacket have changed to name the publisher. The foot of the spines are marked Houghton Mifflin Company. The Hobbit. Hardback with dust wrapper. 2nd Edition, 10th (6th) Impression 1958. George Allen &Unwin. 1954 - 2nd/2nd US HMCo. Houghton Mifflin Co. of Boston and New York, 1954. 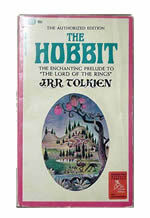 Identical sheets and illustrations as the 6th UK printing (second printing of AU1951), but the binding reverted to a design similar to HM1938, only smaller and without the bowing hobbit insignia on the front cover. 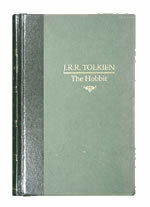 Unlike the corresponding UK edition, the American covers changed color roughly every printing, though samples can be found with sheets from one UK printing and binding color prevalent on a neighboring US printing. Unlike the UK impressions, most of the US printings of the second edition did not declare the impression on the reverse of the title page, making them difficult to identify. 13.0 x 19.0 cm, 315 numbered pages. First Printing, First UK paperback edition Paperback with illustration of the adventurers in the Misty Mountains passes during the storm, by Pauline Baynes. All illustrations have been removed, and the maps are printed in black-and-white. 11 x 17.9 cm, 284 numbered pages. HM1965 — Houghton Mifflin Co. of Boston, 1965? Covers and dust jacket similar to HM1954, but cover is light green and does not vary in successive printings. Color frontispiece removed, and the red from the end paper maps has changed to black. There is no color left within the book at all. These comprise the US 16th through 24th? printings, with sheets printed in the US. Format has enlarged to 13.8 x 21 cm. 315 numbered pages. First Printing, First US paperback edition Paperback with fanciful illustration of Hobbiton in an oval frame with emus and a lion in the foreground. Cover art by Barbara Remington. Maps in black and white; no internal illustrations. 10.5 x 17.7 cm, 287 numbered pages. 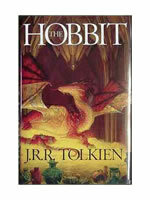 First Printing, Revised Edition paperback On the 6th printing, Ballantine airbrushed out the lion on the cover because it greatly irritated Tolkien. 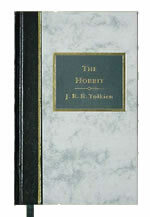 Fourth Printing of the Heritage of Literature Series The Hobbit. Hardback without dust wrapper. The Heritage of Literature Series. Section B, No. 88. 1st Edition 1966. Longman. George Allen &Unwin first Impression of the "Third UK Edition" Similar in design and format to the first Allen &Unwin 1937 edition, but this is the third edition and also the 16th impression counting from the 1st/1st edition of 1937. It has four color plates, and end paper maps in black, white, and red. Similar dust-jacket to the Allen &Unwin 1937 edition. 12.2 x 18.4 cm, 317 numbered pages. 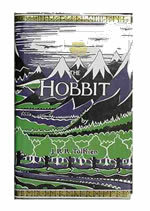 We are working hard to bring more hobbit editions... please pop by regularly and see this section grow!! 1966 - Unwin Books Unwin Books of London, 1966. 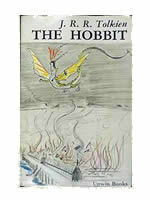 Paper jacket on stiff paper with Tolkien's color pencil illustration of Smaug over Lake Town. Maps in black and white; no other illustrations. 12.2 x 18.4 cm, 271 numbered pages. The Hobbit. Hardback with dust wrapper. 3rd Edition, 17th (3rd) Impression 1967. George Allen &Unwin. The Hobbit. Hardback without dust wrapper. Pleasure in Reading Edition, 2nd Impression 1970. Longman. The Hobbit. Hardback with dust wrapper. 3rd Edition, 6th Impression 1971. George Allen &Unwin. The Hobbit. Paperback. 1st Unwin Paperback Edition, 14th Impression 1972. Unwin Books. Cover Illustration – ‘Death of Smaug’ by JRRT. The Hobbit. Hardback with bound on dust wrapper. 3rd Edition, 7th Impression 1972. George Allen &Unwin. Ex-library – dust wrapper bound onto boards. Resized and end-papers removed. The Hobbit. Paperback. 4th (School) Edition 1972. George Allen & Unwin. Introduction by R.S. Fowler. Cover Illustration – ‘Conversation with Smaug’ by JRRT. Houghton Mifflin Company of Boston, 1973. Forest green simulated leather boards with red and gold gilt runic inscription around the periphery in front and a stylized road-going-into-forest-in-front-of-mountains illustration in gold gilt a little above center. Matching slipcase in simulated leather with the same cover illustration on a paste-down in green, black, and yellow. Printed on heavy paper. All original illustrations from HM1938 restored, including color plates. Black-and-white illustrations printed as black-and-green, maps in black and green, and each page neatline is in green. 18 x 23.5 cm, 317 numbered pages. Book-of-the-Month edition, distinguished by annotation on the copyright page. Ballantine Books, Inc., of New York, 1973. Continuation of BB1965. 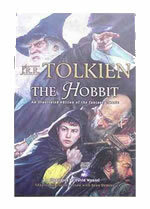 Cover art has changed to Tolkien's illustration of Bilbo Comes to the Huts of the Raft-elves. The Hobbit. Paperback. 4th (School) Edition, 2nd Impression 1974. George Allen &Unwin. Introduction by R.S. Fowler. Cover Illustration – ‘Conversation with Smaug’ by JRRT. The Hobbit. Hardback with dust wrapper. 3rd Edition, 10th Impression 1975. George Allen &Unwin. The Hobbit. Hardback in slipcase. 1st Deluxe Edition 1976. George Allen &Unwin for The Folio Society. The Hobbit. Paperback in slipcase. Reset (New Edition), 2nd Impression 1976. Unwin Paperbacks. Cover Illustration - 1937 Design by JRRT. In slipcase collection ‘The Hobbit and Other Stories’ with ‘Farmer Giles; The Adventures of Tom Bombadil’ and ‘Tree and Leaf; Smith of Wootton Major; The Homecoming of Beorhtnoth’. First Printing, illustrated by Rankin/Bass Harry N. Abrams, Inc., of New York, 1977. Illustrations by Lester Abrams et al, from the 1977 Rankin/Bass Productions, Inc., animated film. All illustrations in full color, some fold-out. 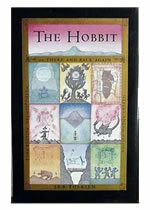 Illustrations printed directly on the front and back boards: (front) the company in the Misty Mountains during the storm; (back) Smaug's treasure. 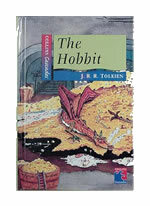 Clear acetate jacket overlays the book title and author onto the boards' illustrations and augments the cover illustrations with Smaug's image. In the front, he's flying around the mountain to attack the company, even though the illustration is of the Misty Mountains, not the Lonely Mountain. On the rear, Smaug lies on his hoard. Bilbo's ghostly image appears in the foreground. 29.4 x 27.7 cm, 220 numbered pages. 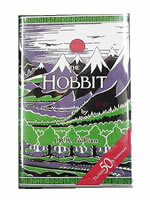 First Impression of the "Fourth UK Edition"
The Hobbit. Hardback with dust wrapper in slipcase. 4th Edition 1978. George Allen &Unwin. 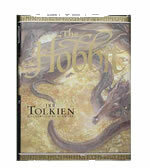 In slipcase with 3 Volume LotR and The Silmarillion – The Tolkien Library. The Hobbit. Paperback. First Methuen Edition October 1978. Methuen. Illustrations from the Rankin/Bass animated film. Paperback in slipcase. Reset (New Edition), 6th Impression 1978. Unwin Paperbacks. Cover Illustration – ‘Conversation with Smaug’ by JRRT. In slipcase with ‘The Lord of the Rings’, ‘Farmer Giles; The Adventures of Tom Bombadil’ and ‘Tree and Leaf; Smith of Wootton Major; The Homecoming of Beorhtnoth’ – ‘The Tolkien Collection’. Folio "First Edition" The Folio Society of London, 1979. Illustrations by Eric Fraser. Burgundy leather quarter-bound with remainder in burgundy cloth on boards. Gold gilt "maze" pattern on front and spine. End-paper maps in black, white and red; other illustrations in black and white. Light gray-green slipcase. 15 x 22.8 cm, 245 numbered pages. Paperback in slipcase. 3rd Paperback Edition 1979. Unwin Paperbacks. 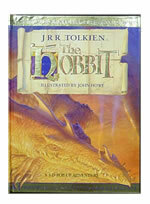 Cover Illustration – ‘Conversation with Smaug’ by JRRT. 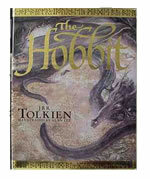 In slipcase with ‘The Lord of the Rings’ and ‘The Silmarillion’ – ‘The Middle-earth Collection’. Paperback. 4th Paperback Edition 1981. Unwin Paperbacks. Cover Illustration – ‘Conversation with Smaug’ by JRRT. Ballantine Books, Inc., of New York, 1981. Continuation of BB1965. Cover art has changed to Darrell K. Sweet's illustration of The Lord of the Eagles. The Hobbit. Hardback with dust wrapper. 4th Edition, 3rd Impression 1982. George Allen &Unwin. 1982 The Hobbit. Hardback without dust wrapper. Large Print Edition 1982. Charnwood/Thorpe. 1983 The Hobbit. Paperback. 4th Paperback Edition, 7th Impression 1983. Unwin Paperbacks. Cover Illustration – ‘Conversation with Smaug’ by JRRT. Ballantine Books, Inc., of New York, 1985. Continuation of BB1965. 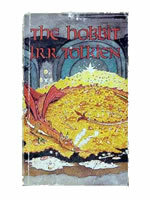 Cover art has reverted to Tolkien's illustration of Bilbo Comes to the Huts of the Raft-elves, but framed and shrunk down comparatively. Houghton Mifflin Company of Boston, 1987. 50th Anniversary Edition. Similar in design to HM1973, but covers and slipcase are in gold instead of green, and the front cover illustration is a "50" in green. All monochrome illustrations, including maps, in gold and black instead of green and black. Color plates same as HM1973. 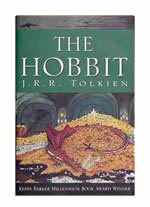 Foreword by Christopher Tolkien describes the history of the writing and publication of The Hobbit. Book-of-the-Month Club edition, distinguished by annotation on copyright page. Unwin Hyman of London etc., 1988. The Annotated Hobbit. Extensively annotated text by Douglas A. Anderson. 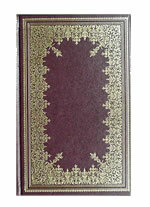 Black cloth binding on boards. Purple dust jacket framed in black, with centerpiece title above a copy of the original dust jacket. Interior illustrations culled from most extant editions, especially foreign-language. Annotations include all significant changes to the text from the 1937 original. 22.0 x 28.8 cm, 335 numbered pages. Houghton Mifflin Company of Boston, 1988. American edition of UH1988. Blue paper binding on boards. Dust jacket is an enlargement of the original 1937 dust jacket. Interior same as UH1988. Galahad Books of New York, 1989. Red cloth binding over boards. Smaller reprint of HA1977 with similar dust jacket art but on paper. 27.2 x 22.9 cm, 220 numbered pages. First Printing of the Reset "Fifth UK Edition"
Cover illustration by John Howe "